Keep this simple snow removal tips in mind this winter. If you are in the Beaverton area and in need of snow removal or snow management services, give us a call 330-299-4404. The first step in residential snow removal is to invest in a quality shovel. While some equipment is more or less the same regardless of price, this is not the case for snow shovels. A cheap, flimsy snow shovel will drive you mad. Instead, opt for a strong lightweight shovel coated with a nonstick finish. You also want to take into consideration the type of area you’ll be shoveling — decks, pavement, etc. Also, be sure to properly space your hands for optimal leverage and to push snow rather than lift it. And don’t forget to warm up and stretch your muscles. 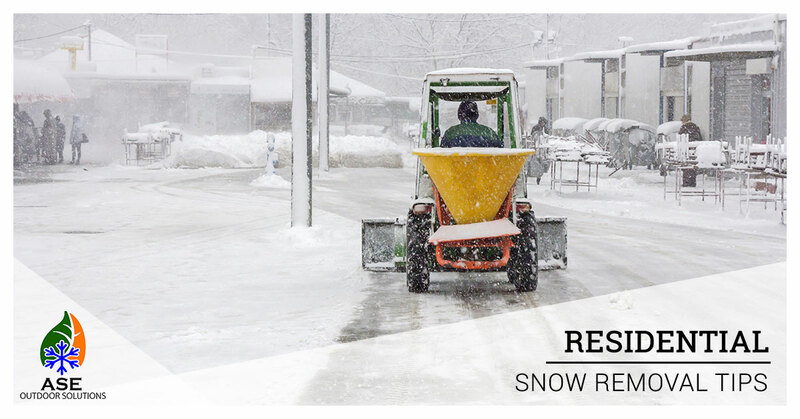 If the forecast is calling for snow and icy conditions, pre-treat your paved surfaces. This will make the snow removal process much easier. Keep in mind that while salt can be helpful for removing snow and ice, it can be damaging to the surrounding area and landscape. If you’re looking for a less harmful way of providing traction to slippery surfaces, consider using sandbox sand or even cat litter to add traction to your driveway and sidewalks. If you really want to make snow removal a breeze, invest in a snow blower. Snow blowers are by far the fastest method when clearing large, flat areas. This not only reduces the effort and time, but it also can significantly reduce the strain on your back and body. Don’t Have Time For Snow Removal? No problem. We’ve got you covered! If you are in the Beaverton area and would like to work out a snow management plan for your home this winter, contact us today. From clearing your driveway to de-icing your sidewalks, we can keep your home safe and clear all winter. Give us a call at 330-299-4404 to learn more.